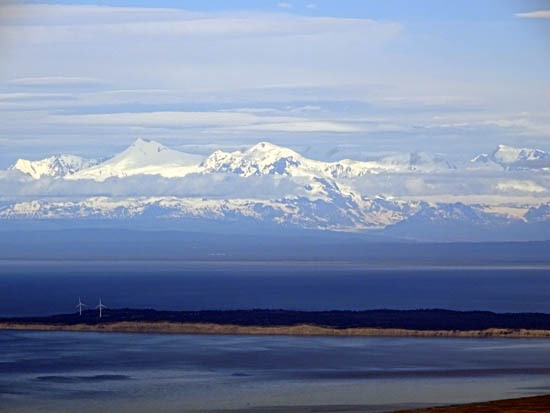 the Alaska Range, Chugach Range, Cook Inlet, and Anchorage. Popular berry picking area in fall." 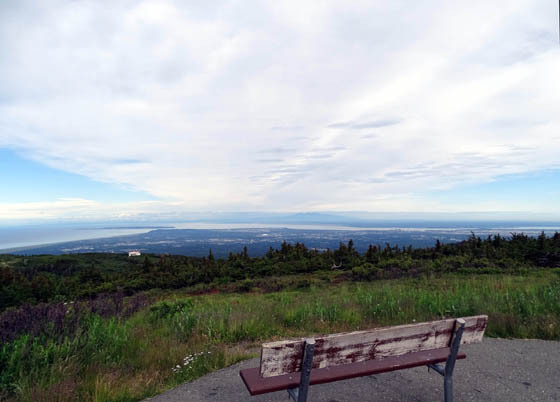 When we visited Anchorage three years ago Flattop Mountain was at the top of my list of hikes because there is so much information about it in all the publications and on websites about the Chugach Mountains that dominate the view east of the city. Surely I had to see why it is so popular, no? Jim and Cody accompanied me on that hike and we did, indeed, see why it's such a popular hike. 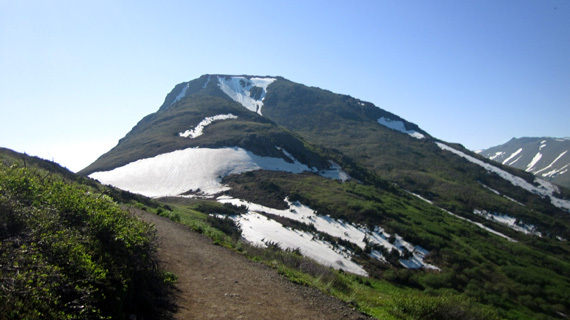 Although the steep, rocky upper part of the main trail is a challenge to ascend and descend, the panoramic views from the summit are spectacular. 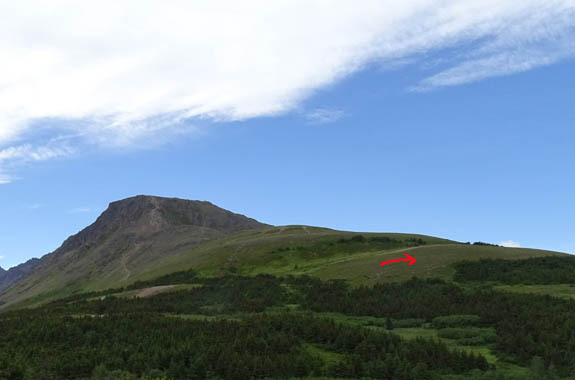 Jim, in white shirt, waits for me to catch up on the steep upper section of Flattop on 6-22-2012. 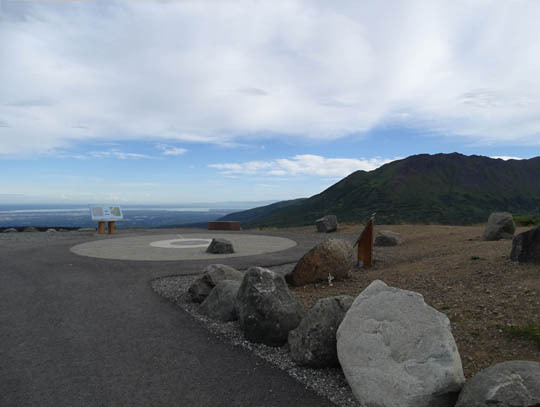 Now that I've also seen the 360-degree views from Bodenburg Butte, which is lower and easier to climb, I can tell you that the views from it are equally stunning. 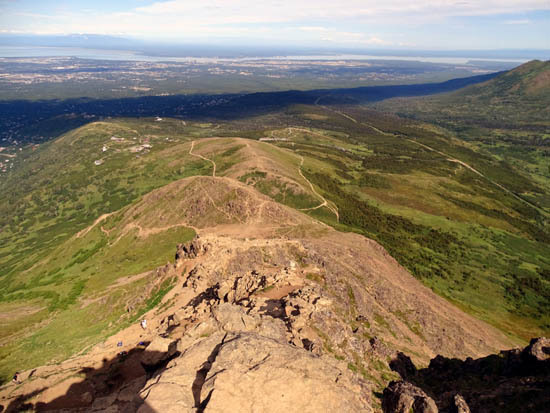 But I still had the itch this summer to climb Flattop again. I've just been waiting for a weekday (fewer people) and clear weather. 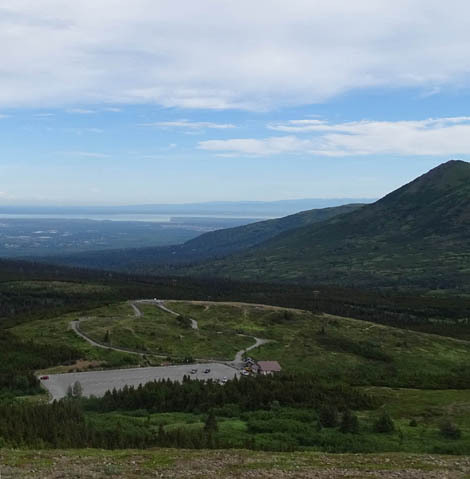 This morning the stars aligned and I drove down to the Glen Alps parking area to begin my assault on Flattop. 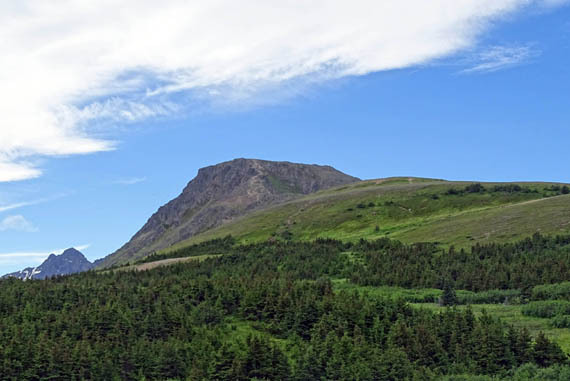 View of Flattop today from the north; it's not really "flat" on top but it's easy to walk around up there. It was sunny when I got up at 7:15 AM so I hustled to get ready to leave for my hike. I wanted to avoid as much morning traffic as possible but get there before most other hikers and while the sun was still shining. By mid-afternoon it was overcast and we got some rain in the evening. The area really needs more rain but I didn't want to hike in it. 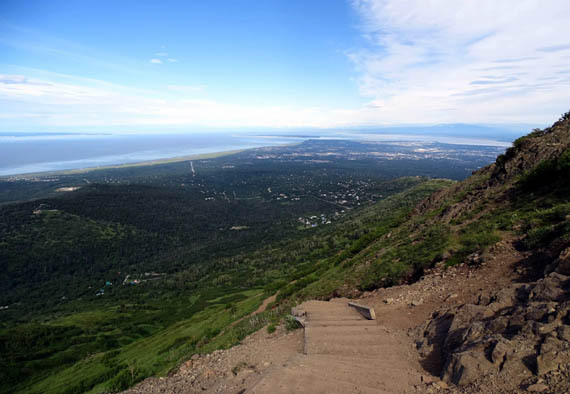 Temps were unusually warm today -- a high of 83 F. in Anchorage, only the fourth day so far this year above 80 and well above the average of mid-60s in June. I got to the Glen Alps trailhead about 9:15 AM. 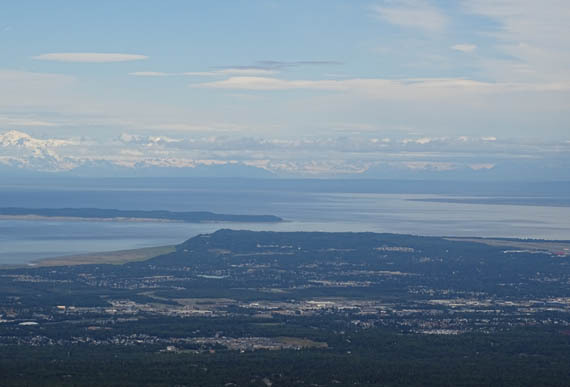 It's an 18-mile drive from our campsite at JBER, through the base and eastern side of the city. 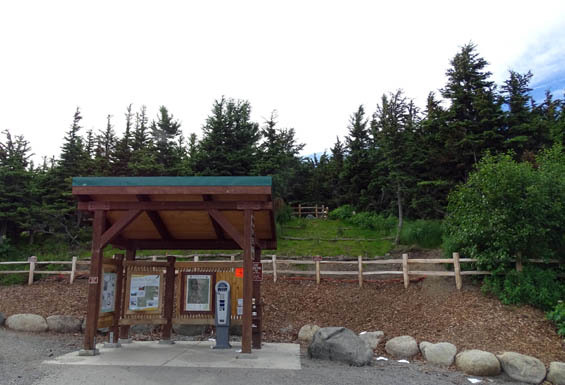 There were only about fifteen vehicles in the parking area when I arrived and paid my $5 Chugach State Park fee. 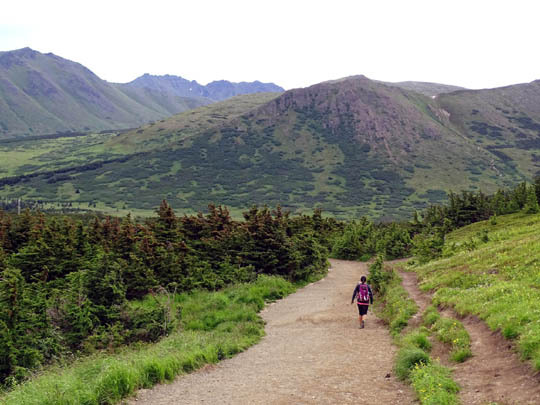 Several trails begin at Glen Alps, the most popular trailhead in Anchorage. Since we were here three years ago a second, smaller parking lot has been added beyond and below the original one. Even with the additional parking both lots fill up on busy summer days. 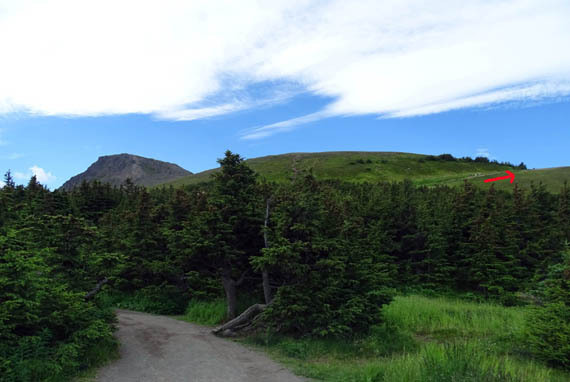 The beginning of the Flattop Mountain Trail has been modified, too, with a wide switchback instead of steps going straight up to the first part of the trail through some low spruce or fir trees. There used to be steps going straight up behind the kiosk. Now the trail switchbacks more gradually. I went alone today. 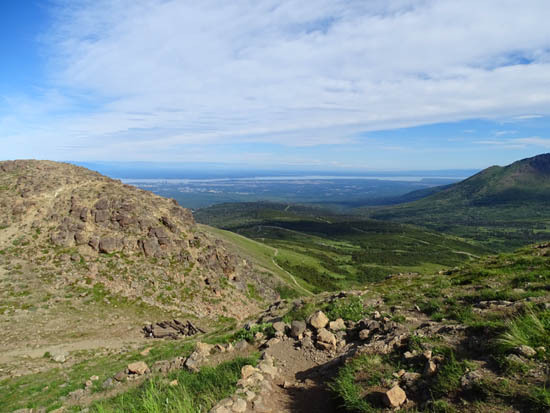 Jim hiked to the summit of Flattop with me three years ago but knew he didn't want to do this gnarly trail again so close to his bike race. Cody did fine last time but he's aged more in the last three years than we have; I didn't want to stress him that much. Casey would do fine on the steps and boulders but, well, she's just too much for me to handle on a steep, unstable trail like this one. My goal was to go slowly for safety and views, and to have fun. 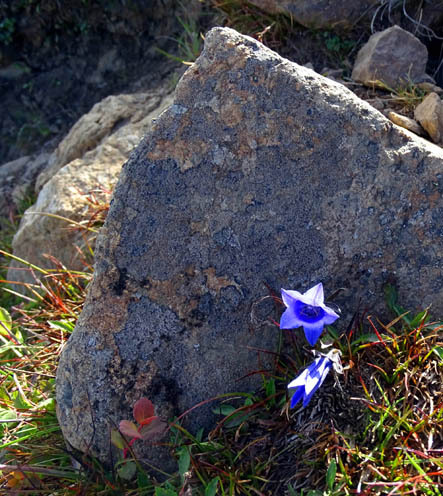 Today there was no snow on the mountainsides or trails, no mud, no snowmelt. 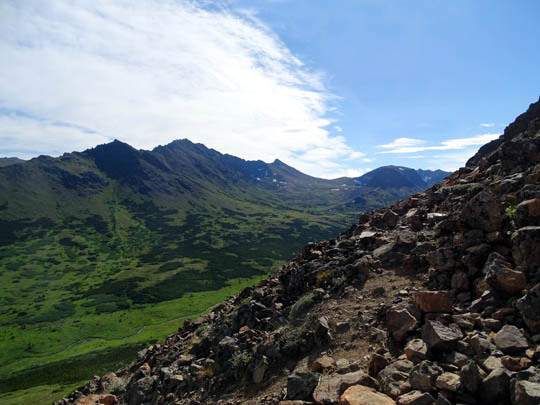 Instead, the main trail was dry, dusty, and full of scree on the steep upper half. As a warm up I did a half-mile loop on the paved, handicapped-accessible overlook trail above the main parking area. We didn't go up this trail the last time we were here. 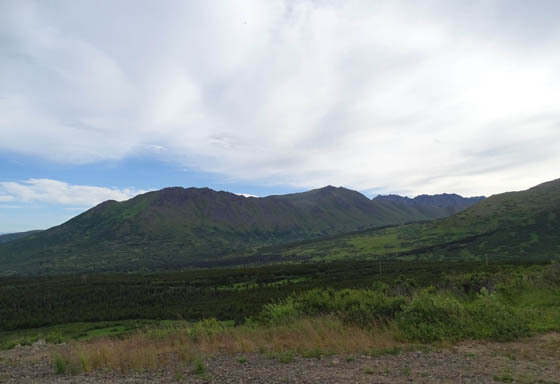 (Denali was visible, but you can't see it in this small photo). 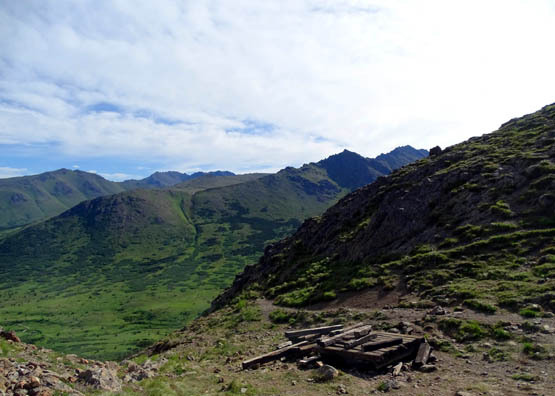 Looking up the main trail on Blueberry Knoll from the Overlook Trail; Flattop is in the background. 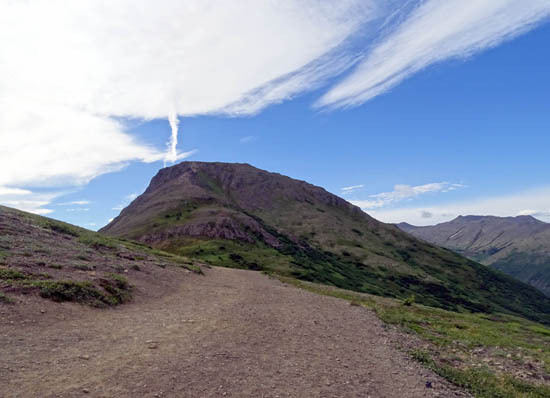 Then I hiked up the main trail to the edge of the broad summit of Flattop, a distance of about 1.7 miles one way and an elevation gain of 1,300 feet. 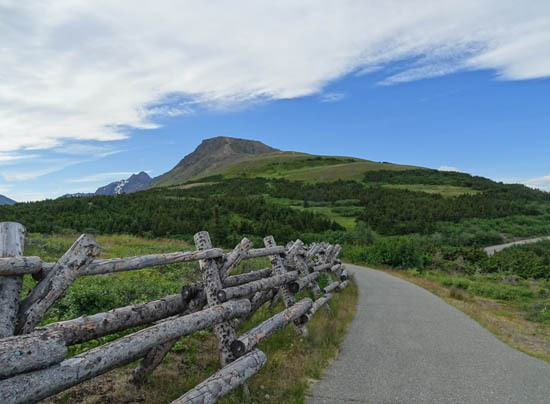 The lower half of the trail will get your heart rate up but it isn't nearly as steep or difficult as the second half of the trail after it intersects with the upper portion of the Blueberry Trail loop. 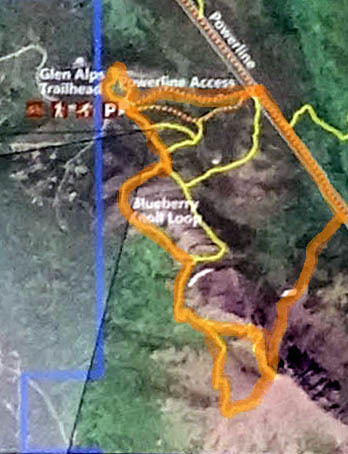 The Blueberry Trail is an alternate way to hike the lower part of the mountain. My plan was to return on the other (east) side of the Blueberry Trail for the last third of the descent, like Jim and I did three years ago. It's a more gentle grade up to the intersection with the main trail. I knew I could do the steeper, rougher part of the loop on the ascent but preferred the easier way going back down (bum knees). 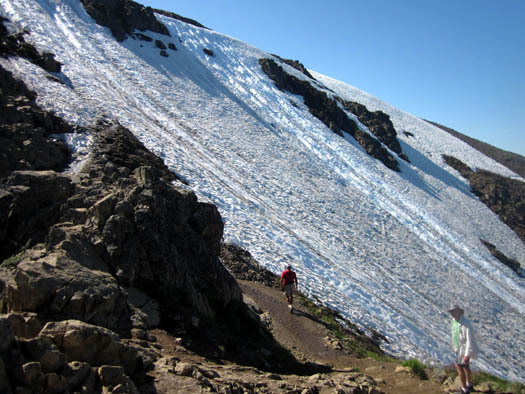 As you'll see, that plan changed completely after I wandered around the summit and saw even more alternatives for my descent. 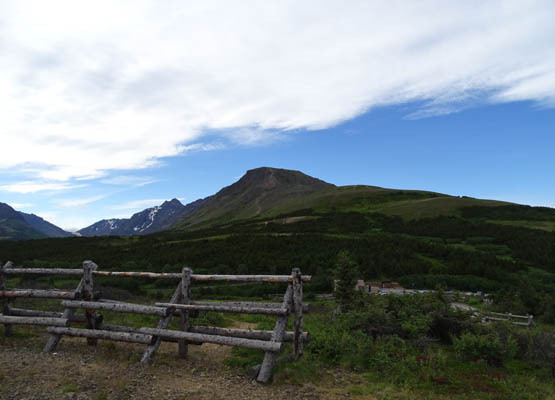 When I got to an overlook about 4/10ths of a mile up from the trailhead I had a good view toward the Alaska Range to the north and I was delighted to see 20,310-foot Denali!! The view got even more clear as I ascended and a few minutes later I could also see Mt. Foraker to the left of Denali. 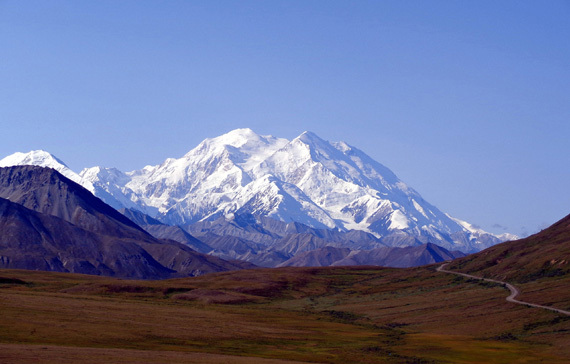 Foraker is over 17,000 feet high. 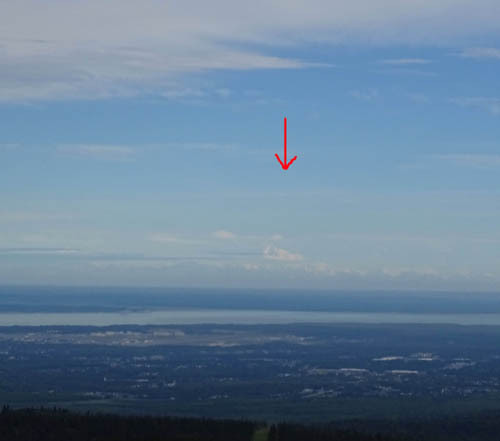 Redoubt, Iliana, and the other volcanic peaks west of Anchorage and the Kenai Peninsula were also fairly visible, although there were some low clouds over them. Very cool! At the upper intersection with the Blueberry Trail I turned right, continuing up the main trail to the summit. 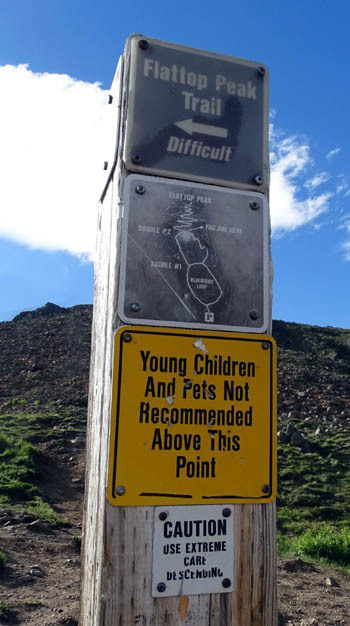 A sign warns hikers of the difficult trail conditions ahead. The irregular steps are hard enough to climb up. I knew they'd be dangerous with my lousy knees coming back down. I had one trekking pole for balance; two poles wouldn't have helped much. 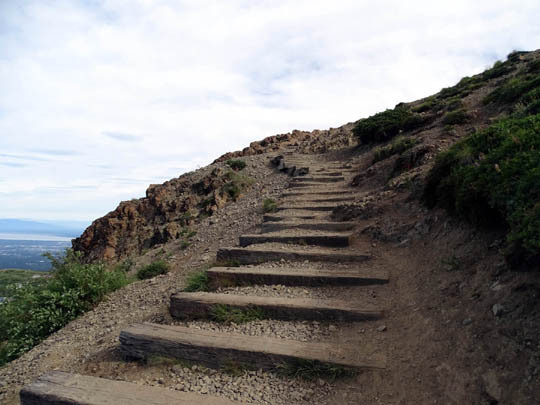 I was already looking around for alternatives to avoid these steps on the descent . . . Above the steps there is a memorial wooden deck and then a saddle. 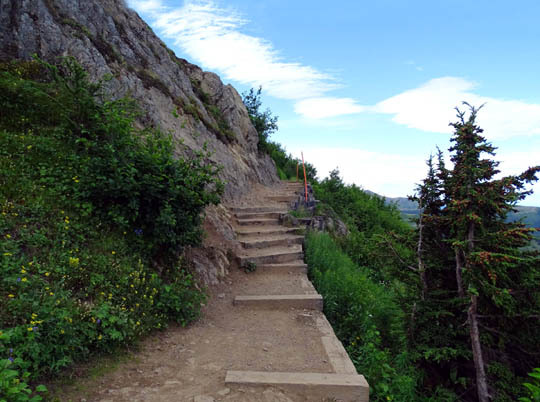 This is another point where some hikers turn around so they can avoid the really gnarly trail from there to the summit. I considered either turning around at the saddle or figuring out another way up. 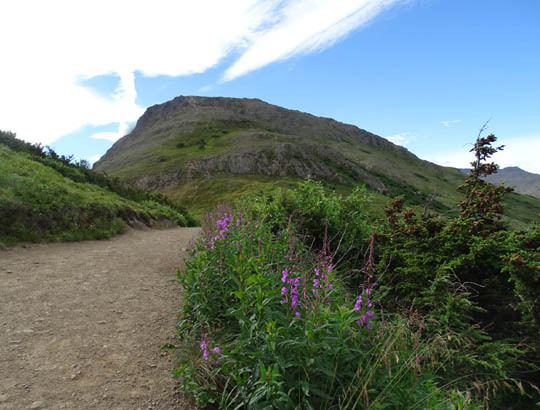 I saw two trails traversing the west side of the mountain that looked easier to get to the top and almost took one of them, but other hikers I saw said those were actually worse than the main trail. I knew I'd regret turning around so I just kept going up the main trail. In retrospect, I'm glad that I continued on. A couple younger folks passed me before reaching the saddle. 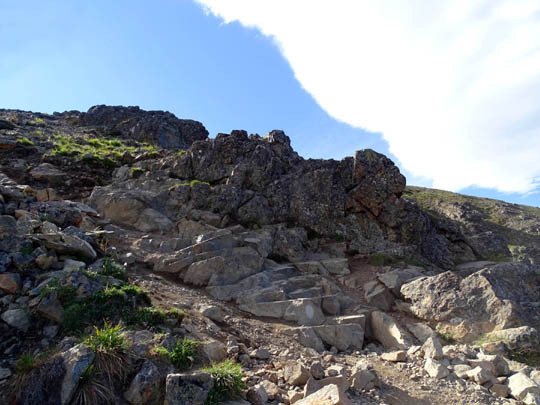 They were far enough ahead of me, and no one was coming down then, that I sometimes couldn't tell which way to go through the rocks when I saw several faint trails going in different directions. It's easier to pick a good line through the rocks going down, when you can see more, than it is going up. 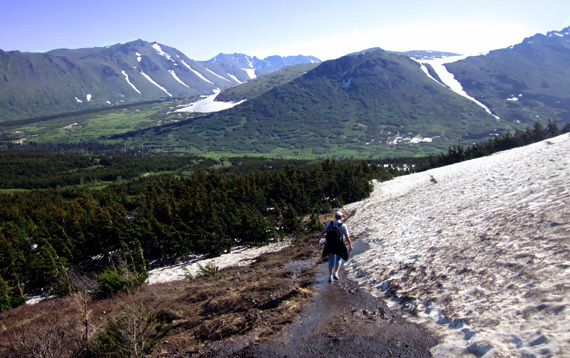 The two trails to the right are the ones other hikers said were worse . . . I finally saw a nice fella coming down toward me and I asked him how he knows which faint trail to take. 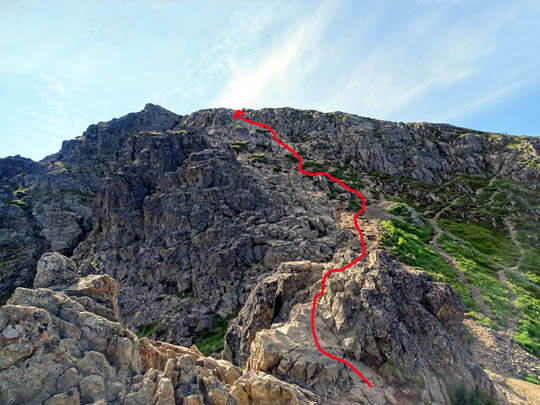 He pointed out some very faded red (now pink) and yellow blotches on the rocks and said that is the official trail, but to go whatever is easiest for me. That's what I did. Another couple passed me before I reached the top and I kind of went the way they did until I couldn't see them anymore. It was easier to follow the trail up and down last time because 1) Jim was with me (two heads are better than one) and 2) there were so many people that day, we could just see where they went. Hiking with fewer people around has its advantages. It also has disadvantages sometimes! The grade is very steep the last few hundred feet of the trail. 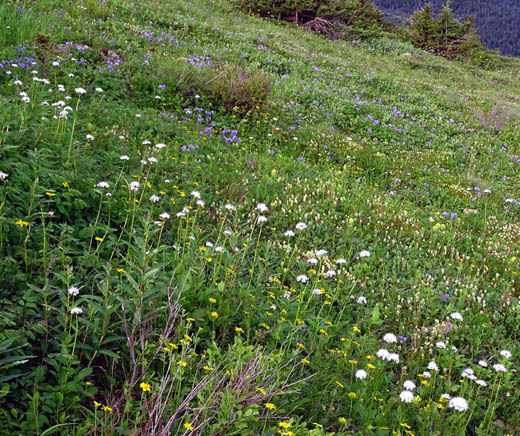 I stopped often to look for the best line up and to admire the awesome scenery around and below me. The tide in Turnagain Arm and Cook Inlet looked to be rather high, which was nice; I like seeing the water more than the mud flats. And the mountains were more visible than when we've seen them on the Coastal Trail this visit. The sunshine and light wind were perfect on the way up and on top of the mountain. It was a great day for this hike and I tried to make the most of it, despite the difficulty negotiating the rocks and my growing anxiety about having to descend that way.